LMK’s commitment to education inspires our most popular and most important service offering: TMF University. TMF University is LMK’s industry-first TMF training program, offering a wide range of courses to suit all needs; from beginners just learning to identify common regulatory documents to professionals seeking to hone their expertise. Celebrating TMF University’s renewed focus on taking TMF action, LMK is happy to present this how-to blog post, the third post in a multi-week how-to series. You can read the series’ last post here. In the coming weeks we’ll continue to dispense with complexity and focus on what it takes to achieve a basic TMF skill we think every clinical research professional should know. 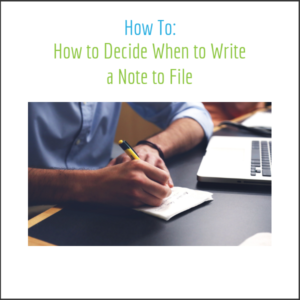 When: When should I write a note to file? Tell a Complete Story: The primary purpose of every TMF is to tell the story of a clinical trial. The story of a clinical trial must relay a powerful narrative about the production of quality scientific data and the protection of patient’s rights and safety. The rationale behind the choice to file (or not file) any single clinical trial document originates from this central purpose. Once written, an NTF becomes a permanent part of your TMF. When writing that NTF, you must consider how the language contained in the NTF contributes to the overall narrative of the TMF. In practical terms, this means that for an NTF to be a worthwhile contribution to your TMF, it must answer more questions than it creates. An NTF should contain content expressing who, what, when, where, and why, and in answering these questions, the NTF document should stand on its own as a complete narrative. If the NTF does not encapsulate the whole story, then supporting documentation should be linked or attached. Your NTF should explain the entire situation and define the problem. It should provide a clear and accurate account of why a process didn’t go to plan or why a document is inadequate. Finally, your NTF must contain more than a surface explanation, and should explore the deeper ‘whys’ of a problem via a root cause analysis. Documents Due Diligence: Even if your NTF tells a complete and accurate story, there is still more work to do. Your NTF must also document your due diligence. If a signature was missing, did you attempt to collect it? Who did you contact? If a process didn’t go to plan, did you try to fix it? What steps did you take to verify that the root cause of your problem was mitigated? Regulators expect these questions to be answered as part of your NTF. If done correctly, an NTF will take more time and effort than if the process or document was handled to plan. An NTF is not and should not be a shortcut or an alternative to timely action. Writing an NTF without taking necessary action will be treated by inspectors and regulators as if nothing was done at all. When: When shouldn’t I write a note to file? No Added Value: Will writing the NTF tell a more complete story than if it weren’t written at all? Consider the scenario of an ALCOA (Accurate, Legible, Contemporaneous, Original and Attributable) issue identified with a single document during QC. If a TMF stakeholder writes an NTF stating that “a footer is incorrect”, or “a signature is missing”, does this add any value to the TMF? Surely, an experienced inspector or auditor will immediately identify these deficiencies when reviewing the document. Stating the obvious doesn’t tell a better story and doesn’t fix the problem, nor does it make the task of maintaining or appraising the health of a TMF easier for your team or an inspector. Attempt to Replace the Irreplaceable: Often, NTFs are written with an “aspirational” purpose. But, as discussed above, the measure of an NTF is the value it adds to the TMF. NTFs that simply state “a document is missing” may provide a TMF stakeholder a sense of closure but will only serve to frustrate those tasked with inspection of the TMF. The reality is simple: no NTF, no matter how detailed, will fully take the place of the original document. Regulators expect to see a contemporaneous TMF that shows how the trial has changed over time. A missing document NTF cannot replace or recreate all the valuable, tangential information that comes with a timely filed original document. Equate More with Better: Several warning letters (including this one) record FDA’s scathing criticism of clinical professionals who chose to substitute dozens of NTFs for their delegated responsibilities. We can all agree that NTFs can be a symptom of laziness, but often, we forget that the industrious and over-eager among us can also misuse the NTF. At LMK we often repeat the golden rule of research, “if it isn’t documented it didn’t’ happen”, but this rule has limits. Improperly using NTFs to document every nuance of your trial can obscure other important elements of your trial’s story. If multiple NTFs are needed, a greater discussion should be taken about the need for a Corrective Action Preventive Action (CAPA) or other QA intervention. When weighing the risks and benefits of writing a note to file, consider that regardless of its content, an NTF will attract attention to that area of the TMF. You can be confident, that despite its ubiquity, there is no regulatory requirement for the NTF. Ironically, although most NTFs are written in an attempt to prevent audit or inspection findings through greater explanation, NTFs themselves are often at the center of the most damaging FDA 483s and negative inspection reports. Writing an unnecessary NTF creates a metaphorical neon sign pointing towards the regulatory weaknesses of your TMF. Frankly, even an NTF which adds value could expose your trial to greater regulatory risk than choosing not to write any NTF at all. Thoughtfully curating the language you include in your TMF is a powerful component of TMF stewardship. Allowing your documents to speak for themselves can send a more powerful message than even the best written NTF.